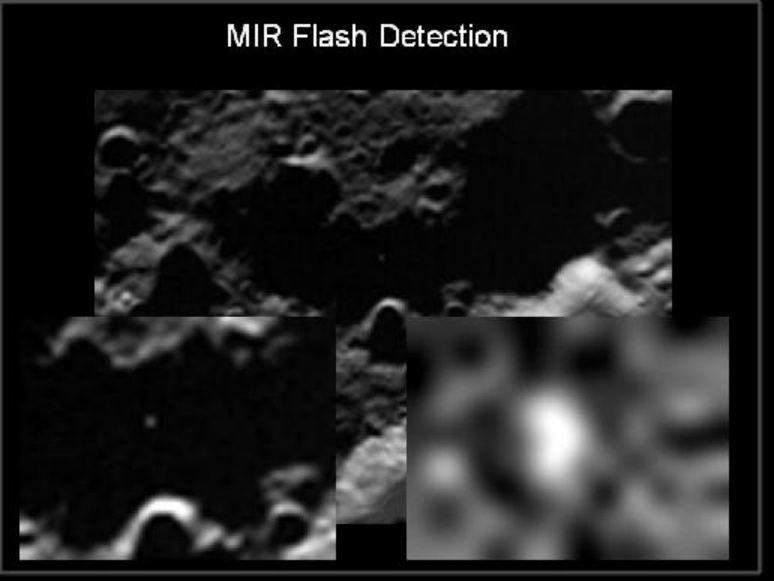 Explanation: This mid-infrared image was taken in the last minutes of the LCROSS flight mission to the Moon. The small white spot (enlarged in the insets) seen within the dark shadow of lunar crater walls is the initial flash created by the impact of a spent Centaur upper stage rocket. Traveling at 1.5 miles per second, the Centaur rocket hit the lunar surface yesterday at 4:31am UT, followed a few minutes later by the shepherding LCROSS spacecraft. Earthbound observatories have reported capturing both impacts. But before crashing into the lunar surface itself, the LCROSS spacecraft's instrumentation successfully recorded close-up the details of the rocket stage impact, the resulting crater, and debris cloud. In the coming weeks, data from the challenging mission will be used to search for signs of water in the lunar material blasted from the surface.